Teaching traditional Mysore-style Yoga for over 20 years in a beautiful and tranquil space, also available for rent, in the heart of Fitzroy, Melbourne. This transformative experience starts its third and final intake beginning in April 2018 and running until May 2019. Byron Yoga Centre’s year-long Certificate IV Yoga teacher training is recognised by Yoga Alliance, Yoga Australia and ASQA (Australian Skills Quality Authority) and qualifies Australian students for Austudy as it comprises 20 hours’ study per week. Starting in March 2018 at the Ashtanga Yoga Centre of Melbourne, the course runs for 12 months and is one of the highest possible qualifications in yoga teaching that is recognised both in Australia and internationally. Join Dr Monica Gauci from 8limbs Yoga in WA for a weekend workshop at our Centre in Melbourne, and learn how to apply functional anatomy to yoga asanas and other yoga techniques. Book now for this weekend’s workshop! Understand the physical and functional miracle of your body at this weekend’s Yoga Anatomy workshop with Yoga Scholar Dr Monica Gauci. Book now to secure your place – there are still some places left. This weekend Level 2 of Byron Yoga Centre’s part-time teacher training returns! It follows the Level 1 training that started in May. There are still places – book now. We are delighted to again host Byron Yoga Centre’s Level 2 teacher training, developed by long-time Yoga Practitioner John Ogilvie. This part-time course comprises 6 weekends over 5 months, starts THIS WEEKEND on Saturday 11 November. It follows on from Level 1 training which began in May, and is internationally (Yoga Alliance) accredited. Being part time on the weekends, these courses are a great way to amass your teacher-training knowledge over a long period without having to take time off work. John Ogilvie is in Melbourne next weekend on Saturday 9 September. 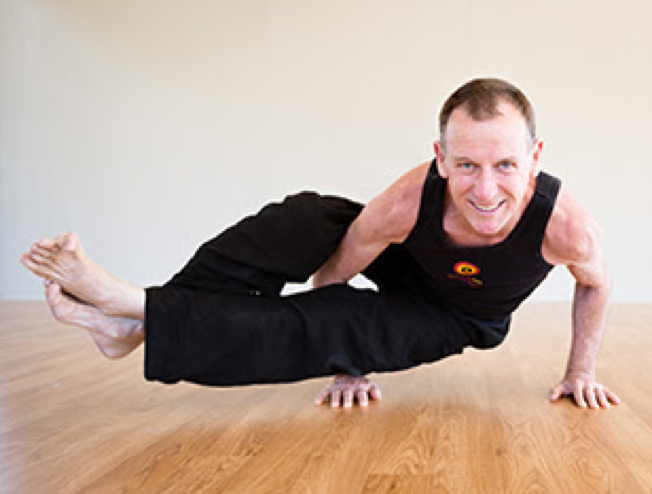 Join his Masterclass at the Ashtanga Yoga Centre of Melbourne from 5.30pm-7pm – only $35. This dynamic masterclass is for intermediate to advanced practitioners and yoga teachers. Taught by long-time Yoga Practitioner John Ogilvie, .John will flow through a Purna Yoga sequence of Level 2 and Level 3 poses designed to challenge and inspire! Byron Yoga Centre’s teacher training is coming to Melbourne in May! Book now to learn with John Ogilvie (pictured) and staff to gain your Yoga-Alliance recognised certification. Starting in May, we are delighted to host Byron Yoga Centre’s Level 1 and 2 teacher training, developed by long-time Yoga Practitioner John Ogilvie. Go to our studio website for full details. We run classes every day of the year for both beginners and experienced students. See our timetable for class times. Visit the <a href="http://ashtangamelbourne.com.au/default.aspx">studio website for more information. We run classes every day of the year for both beginners and experienced students. Visit the studio website for more information.